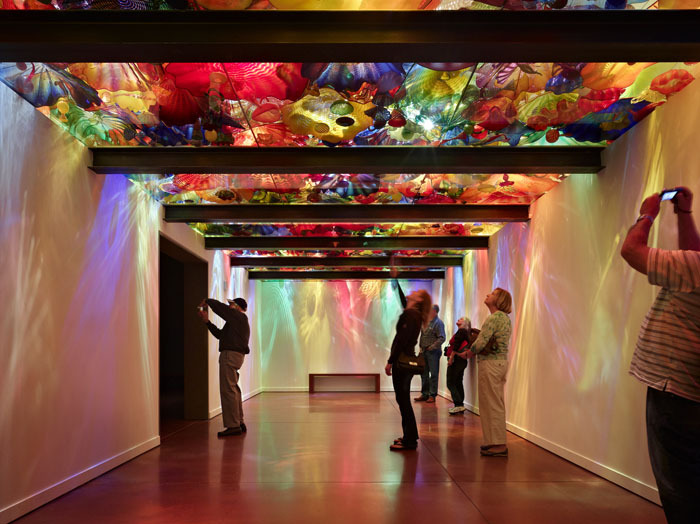 ORA collaborated with Chihuly Studio and the Space Needle to transform the south Fun Forest at Seattle Center into a dramatic new exhibition space and art garden featuring the artwork of Dale Chihuly. ORA created initial architectural designs in late 2009, moved into design development in early 2010, and submitted for permit in May 2011, with construction completed in May 2012. The project includes three primary components: the Garden, the Glasshouse, and the Interior Exhibits, with significant secondary spaces including a 90 seat café with additional outdoor dining, a 50 seat multi-use theater and lecture space, retail and lobby spaces, and extensive public site enhancements beyond the Garden. 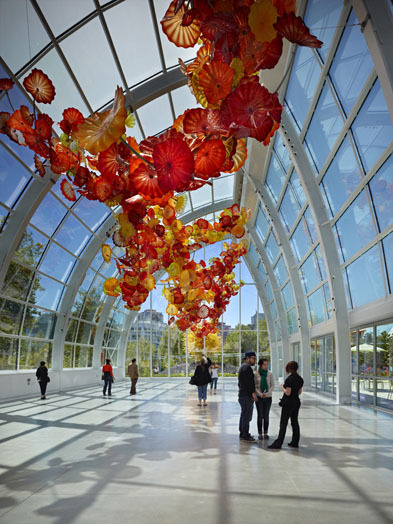 Visitors approach the project through the transformed Seattle Center South Campus Entry, with covered glass canopies and extensive public views of the Art, Gardens, and Glasshouse. 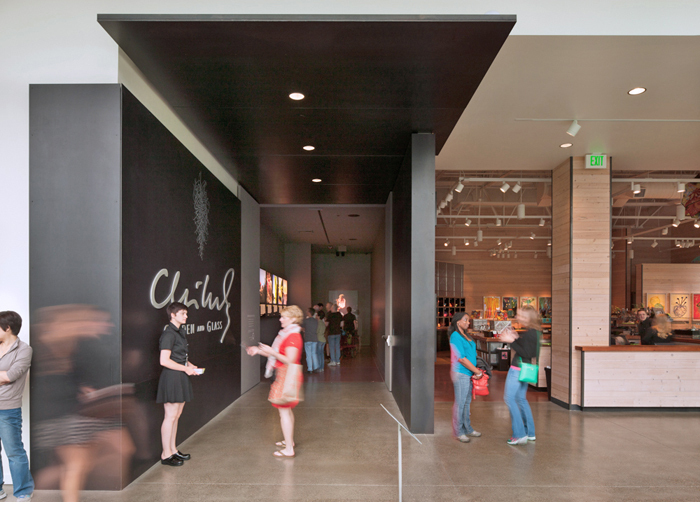 The entry lobby welcomes visitors and provides access to the 12,500 sf interior exhibition spaces as well as the dramatic new retail space. The lobby also creates strong connections with the surrounding campus, with framed views of the Science Center towers. 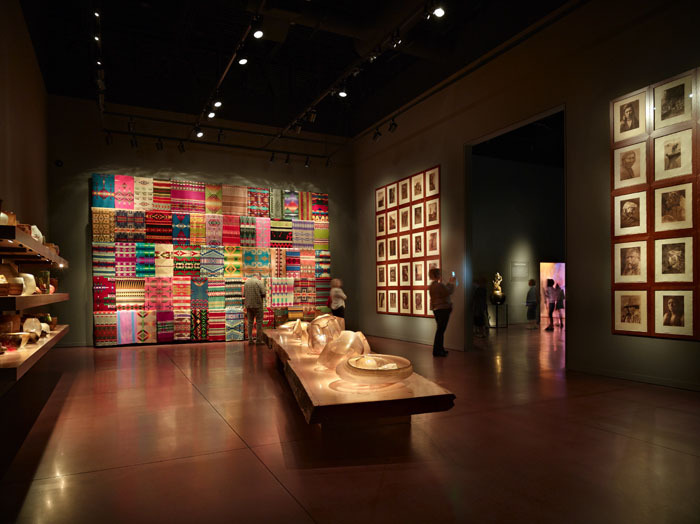 The interior exhibition includes a sequence of eight dramatic galleries each featuring unique Chihuly artwork. From the interior exhibition, visitors arrive at the heart of the project – the Glasshouse, an innovative multi-use space inspired by Chihuly’s love of Conservatories and Botanical Gardens. 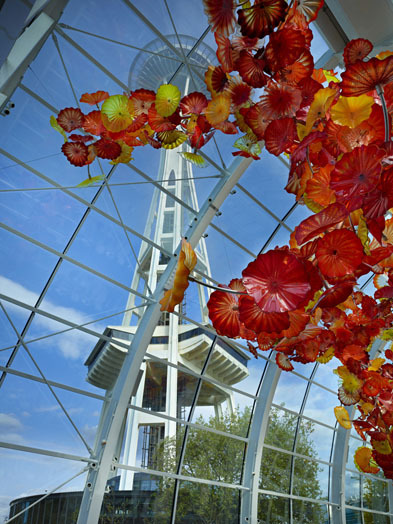 The Glasshouse’s asymmetrical design and shifted site placement respond to the unique urban context at the base of the Space Needle, creating a dynamic spatial experience centered on the new Chihuly chandelier installation with framed views to the Space Needle above. 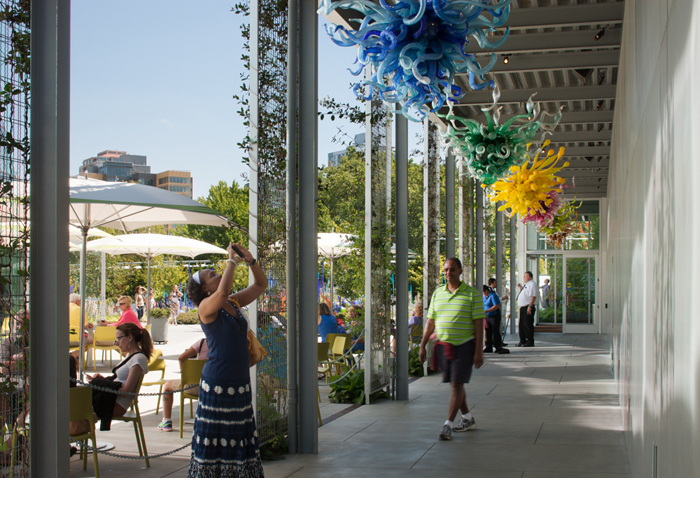 The Glasshouse and adjoining Art Plaza also serves as a highly flexible event space for large public gatherings, from arts group benefits to a wide range of other social functions. 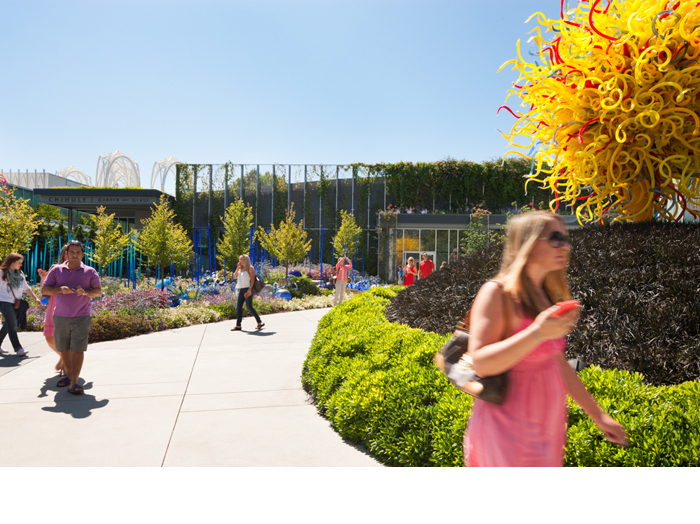 From the Glasshouse, visitors move out into the 20,000sf Garden featuring an extraordinary sequence of artwork and plantings designed by Richard Hartlage in collaboration with Chihuly Studio. Along the east side of the Garden, the new Promenade offers intimately scaled public spaces with open seating areas and lush landscaping. 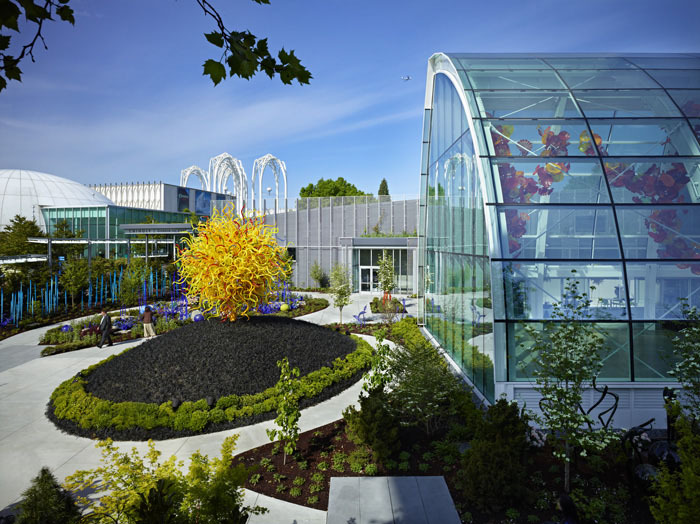 The outdated Fun Forest arcade building was radically transformed with green roofs and evergreen-covered trellis walls, while the highly transparent and accessible Café, Lobby, and Retail spaces provide engaging new public programming and engaging spaces along the north and south public walkways. The west side of the existing arcade building was also transformed with new evergreen screening to create an enhanced backdrop for the historic Horiuchi Mural Stage. The project has been awarded LEED Silver certification. 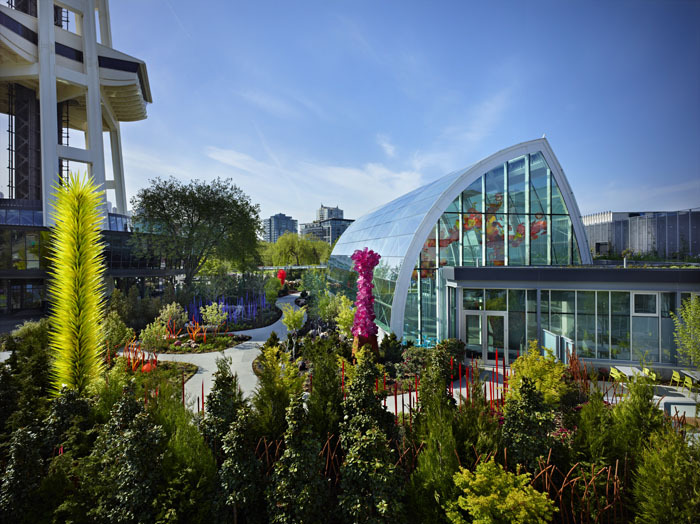 Notable sustainable design features include green-wall and green roof elements, natural ventilation, radiant heating and cooling in the Glasshouse, and transformation of 30,000sf of asphalt paving into lush landscaping. 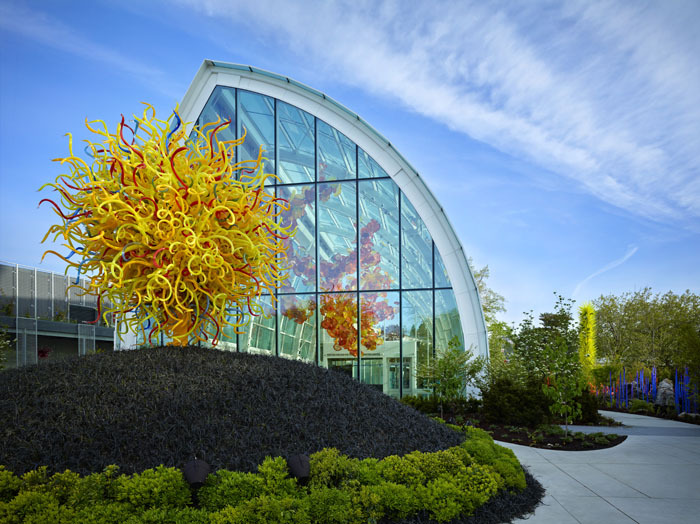 Key design collaborators included Chihuly Studio, AHBL, Seattle Structural, Springline Design, Sparling, Rushing, and O’Brien and Company. ORA also collaborated closely with general contractor Schuchart, project manager Seneca Group to complete the project on budget and within the tight eight month construction schedule.